"Green Infrastructure" incorporates the natural environment and constructed systems that mimic natural process in an integrated network that benefits nature and people. A green infrastructure approach to community planning helps diverse community members come together to balance environmental and economic goals. This course will be facilitated by NOAA's Office for Coastal Management and have a variety of local speakers to make sure it is locally relevant. A final agenda will be posted soon. 6 AICP credits and 5 core continuing education credits for CFM's. 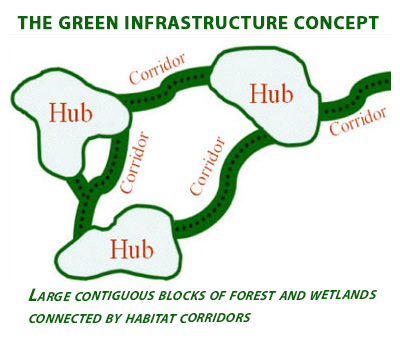 Understand the wide variety of contexts and scales of approaches referred to as "green infrastructure"